Rice Maxey was born in the year 1800, just as the first settlers were moving into Stockton's Valley, Kentucky. His grandfather, William Maxey, was a soldier in the American Revolution and was present at Yorktown during the surrender of the British forces under Cornwallis. In 1834, just as Clinton County was being formed from Cumberland County, Rice Maxey moved here. He had a legal practice and also served as county clerk, and he and his family all became members of Clear Fork Baptist Church. Rice's son, Samuel Bell Maxey [pictured], graduated from West Point in 1846. At West Point, he roomed with Stonewall Jackson. 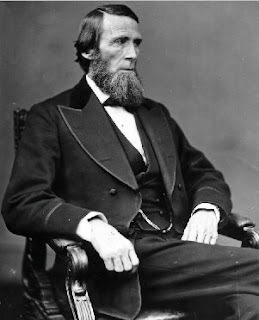 Later, after serving in the U.S. Army during the Mexican War, he moved back to Albany, where he joined his father's law practice, and was also elected both Circuit and County Clerk. In October of 1857, the Maxey family, including Sam, moved to Paris, Texas, where Rice and Sam established a legal practice. In 1860, Sam was elected to the Texas State Senate, but declined so he could fight for the Confederacy in the Civil War. He reached the rank of Major General. Following the war, General Maxey was forbidden to continue his law practice because of his affiliation with the Confederate Army. He went to the highest office in the land, where he received a pardon from his former West Point classmate, President Ulysses S. Grant. General Maxey went on to serve as a Texas United States Senator from 1875 to 1887. "In this country, thanks to free government, we have no hereditary nobility, but we have a nobility far above any that earthly title can give - the nobility God impresses on an honest man." The original 1848 obituary of Clear Fork Baptist Church's first pastor, Isaac Denton, was found pasted onto the back of a photograph taken on April 1, 1902, during the 100th anniversary of the Church. The obituary was written by Rice Maxey.